COMMENT: Good day Sir; How in the world do you do it? It is one thing to develop Socrates and assist clients, but yet another to keep up with and tie in the global events to the waves. I know you don’t sleep much Martin but I have not been dressed in a week and still I miss a couple things. If I’m getting this right various frequencies of currencies and prices are fixed and varied then Socrates somehow sorts all the waves, throws in a time factor that results in a cross of those market waves. Socrates seems to he can smell when the buyers reach that point of re-entry on a bear market or sellers during a bull. It’s extraordinary. It now seems crazy to think I will ever catch up to you without field experience. 4 years of reading/studying/back-checking your models/research/data is a bugger. Then you sens me back to the drawing board about once a month about another factor of the marketplace which didn’t occur to me. So off I go again into the unknown forest not knowing when I will reappear. I am pissed with myself that I am not yet comfortable. This quarter has been good because of a change in method that better resembles the market actions. Socrates is making sense more each day yet still I find pieces that need to fit somewhere. This is the coolest thing I’ve ever done. Working within the walls of a seemingly structured global marketplace I find it is handy to not only be a gentleman study but also know how to think like a thief, a murderer, a snake oil salesman, and a pick-pocket like Browder. Apologies for wasting your time. Lessons of simplicity… My father drew a small circle on the back of an envelope representing my entire knowledge base. I was maybe 15 or 16 so a small circle was appropriate. He said what is unknown to me lies on the outer perimeter of that circle. The more I learn the larger the circle becomes, but correspondingly the outside perimeter of the unknown increases. Thank you for opening the biggest can of worms. REPLY: Life is a journey that we are sent here to learn. You may not realize it, but you are what is truly a “genius” which most people do not understand what it even is. Indeed, some believe if we screw up we are sent back here again to try to get it right. Some believe Buda prayed that he could reach Nirvana and not have to come back here again. It is an interesting perspective on the purpose of life. But what is interesting is that I can agree that this is a journey about gaining knowledge. That is what keeps us both interested and young. If you have no interest in exploring, then you sit in your diapers in old age watching mindless TV shows waiting to be called home. Life ends, in my opinion, when there is nothing left to learn. As long as you are on a journey toward enlightenment all is good. What else would you have in life that feeds your mind with the only food it really needs – curiosity and imagination. 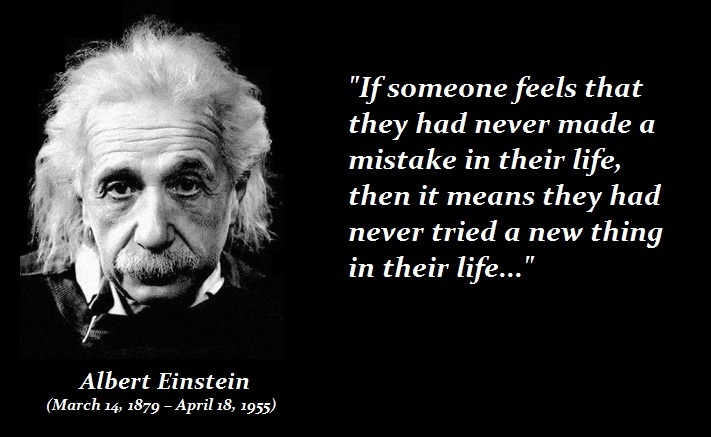 I did not know Einstein. But I knew a professor at Princeton where he taught who did know him. He shocked me one day and said I reminded him of Einstein. I was surprised and said I was not in his league or field. He told me I was. He explained that the common threat was not the subject matter by my curiosity. 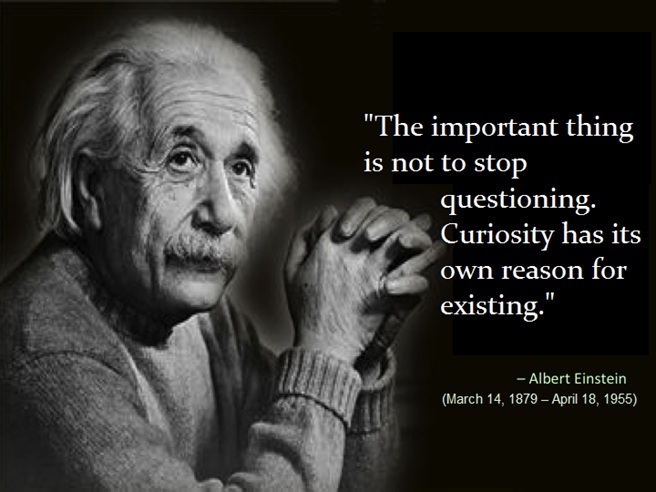 He told me that curiosity was the fuel for all advancement. As long as you are curious and have imagination, and try to figure out what makes things tick, that is the path to enlightenment. There have been studies on what people call “genius” and they have revealed that all such people do poorly in school and tend to get in trouble. In the case of Einstein, his Munich schoolmaster wrote in Albert Einstein’s school report, “He will never amount to anything”, back in 1895. People who explore and test things rather than just regurgitate what they were taught are on the path to enlightenment. We will never advance as a society without exploring how things work. If you are curious and have an imagination, then you will explore new solutions. If you just memorize what the teacher says and get straight As, you will be a follower rather than a leader. The school records of the young Winston Churchill revealed the future war leader was a “naughty child” the teachers said would amount to also to nothing. We have to understand what is really “genius” in order to nurture that in our children. It has NOTHING to do with the level of intelligence of knowing everything like some encyclopedia. Genius is all about dynamic thinking and methodology – seeing the interconnections. I have written before, if you read this blog, chances are you too fall into the category of being a “genius” for your thinking process demonstrates you are on a quest for knowledge. So it is not that a genius knows everything, it is a person who seeks knowledge and thinks dynamically. You must avoid trying to reduce the world to a single cause and effect. It is always far more complex than just that. Look at all the people who dropped out of some university yet started major companies like Steve Jobs, Bill Gates, Mark Zuckerberg just to mention a few (see the list of top 10). The most VALUABLE lesson we can teach our children is HOW TO THINK – not what to think. Why have I poured so much time into programming Socrates? First, it was never a project I could ever give to another to even attempt to code. As far as its model analysis, I have been the only programmer. It takes EXPERIENCE in the subject matter to write such a program. Everyone else codes the delivery system. This is why there is nothing else like it. You had to be a TRADER and a PROGRAMMER to even tackle such an endeavor. My objective was to clone myself. There are so many variables that are involved it quickly exceeds the capacity of any human to keep track of some much in their head and at the tip of their fingers instantly. This is not about writing some algorithm to produce a mean and lean trading machine. Those are one-dimensional systems that will never adapt to changes. For example, everyone rushed into AI to create robot trading. It was assumed the UBS’s push into AI lead to “robots invading the trading world.” Then one year later, UBS was reported to be shutting down its robo-trading system said in a statement that, while it is “satisfied” with the commercial progress of the service, “at this time we believe the near-term potential is limited and have therefore decided to close our digital-only offering in the UK”. You cannot hire programmers to write a trading platform because they can only plug is formulas that are one-dimensional and have a system that will be consistent over time. Long-Term Capital Management crashed after used the Black–Scholes model for which they won the Nobel Prize, yet it failed with volatility and time. They never saw the wave coming at them from currencies which swamped all markets and force funds to sell assets around the world to cover losses in Russia. Even high-frequency trading cannot see the big waves coming from global events and they will shut down as soon as volatility rises. The biggest danger with such systems is they become trapped and cannot escape a financial tidal wave they are incapable of forecasting. It is like just watching gold and nothing else. Everything is connected and then to figure such a system out requires historical data. I have stated plenty of times, I have probably spent far more than a $100 million in today’s terms to collect a database to even train a system. I am always still improving Socrates. As I said, it is my clone. Every trick of the trade I have learned I taught the system and I and always still learning so I had to write the code to allow Socrates to also learn as I have throughout life. The bottom line is rather simple. It does not make a mistake in forgetting to check something because it had a good night or some distracting argument. It is free of such human fralities we are all plagued with.